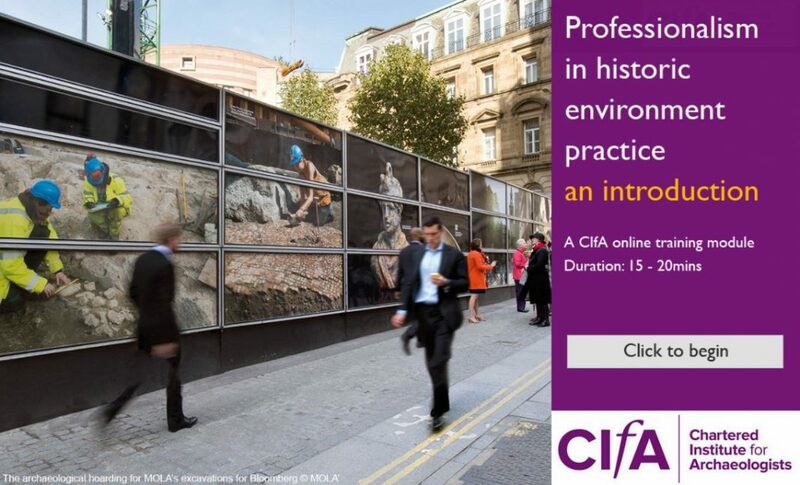 CIfA’s e-learning portal provides online learning courses to help develop your knowledge and understanding regarding heritage and the historic environment. Of course, you must be a member – then you can log in to view your own personal e-learning account. This tells you what courses are available, what courses you have completed and even let you generate certificates for those completed courses. This short e-learning module is based on the CIfA Client Guide published in 2015. It distils the messages from the Client Guide about the importance of professionalism and professional ethics and why they are so important to professional practice and to career progression and personal development. Aimed at Student members, newly accredited Practitioners or indeed anyone who needs a quick refresher, the module supports unit CCSAPAJ3 of the National Occupational Standards for Archaeological Practice, Develop your own resources and protect the interests of others. Having completed the module, you will understand what we mean by ‘professional’ and ‘professionalism’, how to use professional ethics to progress your own career and how professionalism adds value for clients and for society. The module is free and available to all members by logging in to the members only section of our website at http://www.archaeologists.net/elearning. On successful completion of the module, you will be issued with a CPD certificate for your records. CIfA are very interested to hear what you think of the module and whether there are other topics you would like to see in further modules . You can let them know what you think by emailing admin@archaeologists.net.